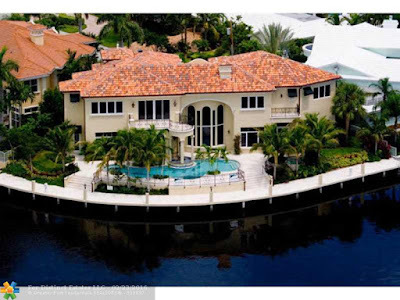 Broward Real Estate: Venetian Isles Waterfront Estate On the Market! Venetian Isles Waterfront Estate On the Market! Come to see this beautiful waterfront home in Lighthouse Point located in the envious Venetian Isles! Exquisite custom estate on a stunning point lot with one hundred and eighty feet on ocean access water. Incredible views from everywhere in this five bedroom, five full and two half bath home with additional den & loft with over eight thousand square feet on a quiet cul-de-sac street in Lighthouse Point. The gourmet kitchen is a chef's dream! Magnificent master suite with sitting room, balcony and stunning bath. All the finest finishes & quality throughout with a resort-style pool and luxurious spa making every day a vacation! A Yachtsman's dream. This home is perfect and will not last on the market! Fort Lauderdale is a city on Florida's southeastern coast, known for its beaches and miles of boating canals. The Strip is a popular promenade running along ocean side highway A1A. Once the site of raucous spring break parties, the Strip is now lined in upscale outdoor restaurants, bars, boutiques and luxury hotels. Port Everglades, in nearby Hollywood, is among the world's busiest cruise terminals. Beautiful Coconut Creek Home On The Market! Gorgeous Estate In Weston For Sale! Parkland Estate On The Market!